Leading Manufacturer of etp & stp blower from Ahmedabad. JYOTI AIRTECH ENGINEERS Make Aeration Blowers Model JR-10 To JR-24. This Blower Design Is 100% Interchangeable & Replacement against SLM-Maneklal Blower Design. JYOTI AIRTECH ENGINEERS Complete Range From 50m3/Hr To 12000 M3/Hr. Suitable For Different Pressure Up To 1 Kg/Cm2 In Single Stage And Up To 2.2 Kg/Cm2 In Double Stage. Also Suitable For Gas Duty As Well As Vacuum Duty (Up To 600 Mbar). 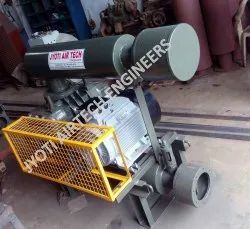 We Are Manufacturer Of ETP/STP Blower Also Known As Root Blower ( Rotary Compressor) for Aeration Purpose Is Very Efficient To Make A Pressure And Mass Flow Rate (Capacity) As Desired Value With Suitable Design And Models. ETP/STP Blower Are Generally Used For Aeration In ETP Tank. The Essential Function Of An Aeration Blower Is To Fulfill Oxygen Demands And Maintain The Treatment Process At The Lowest Possible Costs. A Common Measurement Of Proper Air Flow For The Treatment Process Is To Check The DO (Dissolved Oxygen) Concentration. Looking for “ETP STP Root Blower”?